First, it appears to me that investment professionals and the public in general are getting accustom to significant market swings both Up and Down. How often to we hear “the Dow is on a tear, Up over 150 points”, or “the Dow is plummeting over 200 points at this hour!”. It appears to me we hear similar phrases more often. But it doesn’t have to be that way. The market can, and often, does not do much of anything. 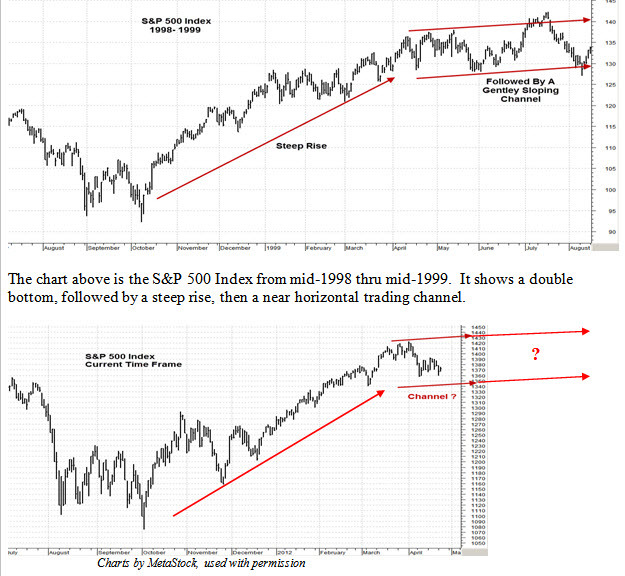 So I hold out for your consideration the following charts. Now I’m not trying to predict anything, but my point is that this is a possible (yes, maybe likely) scenario for the near term future. Just keep an open mind. The market doesn’t “Have To Do” anything. In this type of environment, sector and stock selection would be important if one is to gain any head way on the market in general. We may have seen the big move for the year in this market already, and the next 5-6 months may be relatively tame in comparison. A third alternative to “the markets Up, the Markets Down” scenarios.